I went to the Gun Rights Policy Coference (GRPC) in Tampa this weekend, to meet and network with many folks in the 2A restoration community. This is a great event, giving the opportunity to meet with such giants in the movement as Alan Gottlieb, founder of the Second Amendment Foundation (SAF); Larry Pratt of Gun Owners of America (GOA); and David Keene, former president of the NRA and Opinion Page Editor of the Washington Times. Then there was Alan Gura, the attorney who won both the Heller and McDonald cases at the Supreme Court, Tom Gresham, host of Gun Talk Radio, Mark Walters of Armed American Radio and Jeff Knox of The Firearms Coalition. These are some of the individuals who are giants in the right to keep and bear arms community. GRPC had an awards luncheon on Saturday, where Alan Gottlieb presented awards to individuals who have made significant contributions to the cause. 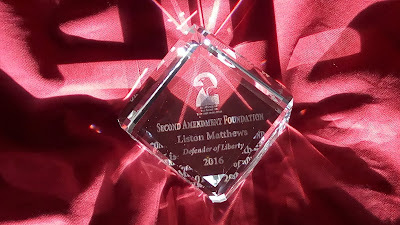 Imagine my surprise when Alan called out my name as one of the recipients of the SAF Defender of Liberty award for 2016. I think if anyone had been looking at me, they would have seen my shocked face. I was glad to see that Cheryl Todd of Gun Freedom Radio received this award, too. There were are others who are equally as deserving if not more so. Just to name a few that I know: Rob Morse (Slow Facts), John Richardson (No Lawyers, Only Guns and Money), Rachel Malone (Texas Firearms Freedom), and Dr. John Edeen of Doctors for Responsible Gun Ownership (DRGO). So . . . . what's next? Well, we still don't have Constitutional Carry in Tennessee. The City of Knoxville is still banning guns at Chilhowee Park, the zoo, and Ijams Nature Center; and shooting ranges within the City. Knox County still is banning guns at libraries, Farragut Town Hall's recreation area is posted . . .
Congrats, you deserve it. I'm proud to have a SAF Defender of Liberty here in Knoxville. congratulations Liston. You are a tireless defender of the 2nd Amendment and richly deserving of this award.